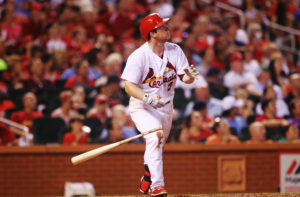 The Cardinals homered four times in the first three innings and cruised past the Padres 9-5 in San Diego. Paul DeJong hit a three-run shot in the second inning followed by solo-homers from Harrison Bader, Marcell Ozuna, and Jedd Gyorko to make it 6-0 in the third. Tommy Pham also went deep and Luke Weaver tossed five frames of scoreless ball to pick up the win. The Cards improved to 22-14.